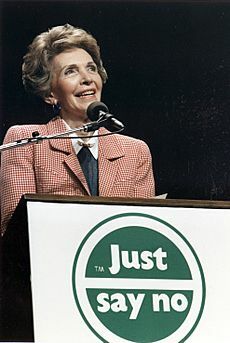 First Lady Nancy Reagan speaking at a "Just Say No" Rally in Los Angeles. "Just Say No" was an advertising campaign, part of the U.S. "War on Drugs", prevalent during the 1980s and early 1990s, to discourage children from engaging in illegal recreational drug use by offering various ways of saying no. The slogan was created and championed by First Lady Nancy Reagan during her husband's presidency. The campaign emerged from a substance abuse prevention program supported by the National Institutes of Health, pioneered in the 1970s , which included teaching student skills to resist peer pressure and other social influences. Nancy Reagan first became involved during a campaign trip in 1980 to Daytop Village, New York. She recalls feeling impressed by a need to educate the youth about drugs and drug abuse. Upon her husband's election to the presidency, she returned to Daytop Village and outlined how she wished to help educate the youth. She stated in 1981 that her best role would be to bring awareness about the dangers of drug abuse. 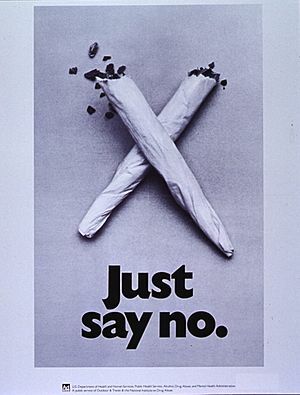 The "Just Say No" slogan was the creation of Robert Cox and David Cantor, advertising executives at the New York office of Needham, Harper & Steers/USA in the early 1980s. In 1982, the phrase "Just Say No" first emerged when Nancy Reagan was visiting Longfellow Elementary School in Oakland, California. When asked by a schoolgirl what to do if she was offered drugs, the First Lady responded: "Just say no." Just Say No club organizations within schools and school-run anti-drug programs soon became common, in which young people were making pacts not to experiment with drugs. The campaign and the phrase "Just Say No" made their way into popular American culture when TV shows like Diff'rent Strokes and Punky Brewster produced episodes centered on the campaign. 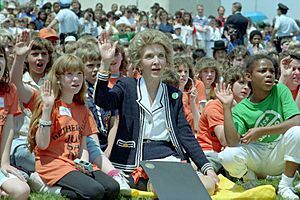 In 1983, Nancy Reagan appeared as herself in the television programs Dynasty and Diff'rent Strokes to garner support for the anti-drug campaign. La Toya Jackson became spokesperson for the campaign in 1987 and recorded a song titled "Just Say No". In 1985, Nancy Reagan expanded the campaign internationally. She invited the First Ladies of thirty various nations to the White House in Washington, D.C. for a conference entitled the "First Ladies Conference on Drug Abuse". She later became the first First Lady invited to address the United Nations. She enlisted the help of the Girl Scouts of the United States of America, Kiwanis Club International, and the National Federation of Parents for a Drug-Free Youth to promote the cause; the Kiwanis put up over 2000 billboards with Nancy Reagan's likeness and the slogan. Over 5000 Just Say No clubs were founded in schools and youth organizations in the United States and abroad. Many clubs and organizations remain in operation around the country, where they aim to educate children and teenagers about the effects of drugs. Just Say No Facts for Kids. Kiddle Encyclopedia.